Sunday was an emotional day for us. After months of training, it was finally time to get our tried and tested running gear on, slap on a bit of vaseline, fill our pockets with gels and Shot Bloks and run the Yorkshire Marathon. It felt like we’d been on this trajectory forever but, despite our careful preparation, we were two fizzy little bundles of nerves on the drive over to York. Given this, we’re not going to do a mile by mile breakdown of the race (mainly because we could barely string coherent thoughts together afterwards, let alone give a blow by blow account of the day). Instead, we’ll list our highs and lows from the day. That’ll do, won’t it? 1 Toilets, loads of them! The race started and finished on the University of York campus so there were loads of lovely toilets that had water, soap and hand driers. This is probably the best thing we’ve experienced in a race ever ever. The most popular search term on our blog is ‘peeing before a marathon’ so we know that lots of people will join with us in celebrating this spectacular sanitary provision. Thanks, Run Yorkshire – you made a lot of nervy-bladdered runners very happy. 2 Running through the city centre with the bells of the Minster ringing was amazing. 3 The scenery on most of the route was lovely and where there were crowds they were really supportive. People really are good, decent, kind, supportive, enthusiastic, sweet etc. 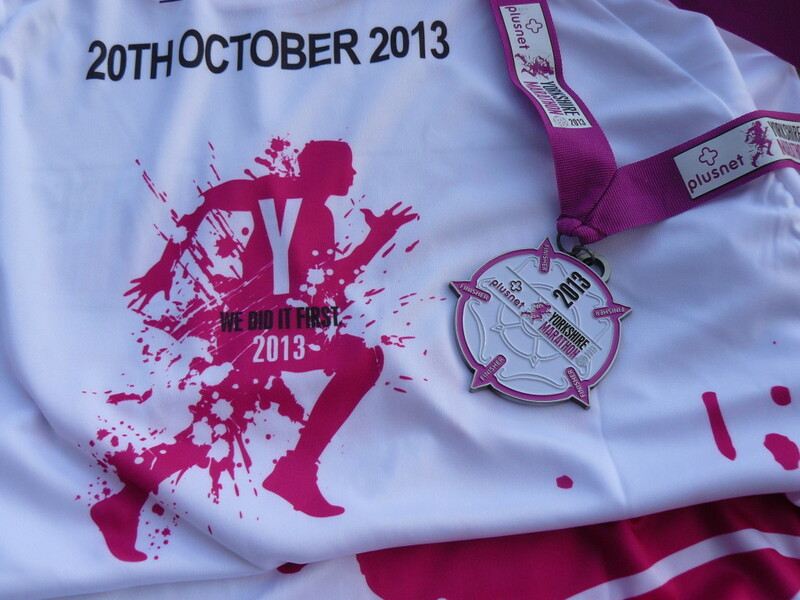 5 The finishers tee shirt and race medal are fantastic – finally a race with some decent design sensibility! 6 The campus lake formed a great backdrop for post-race photos. Mere serendipity, we’re sure, but it was lovely to be in a pretty, peaceful place at the end. 7 We invented Pecan and Pear Recovery Cake, which may prove to be our culinary raison d’etre and legacy to humankind. 1 The guidance (we use the term loosely) about transport and parking was awful. Unclear, unhelpful and at times in emails downright obstructive. It was particularly difficult for family and friends arriving later to understand how they were supposed to get anywhere near the event. 2 The out and back on an A road between miles 16 and 20 was gruesome. No need for it at all – there must be a better way to route the race. 3 Speaking of which, the last mile was a bloody hill!! Someone told us it’s the only hill in the city centre. That is sooooooo harsh. In truth, it’s probably not that massive but it was a teensy bit unfair to impose it on runners at the end of a marathon. 4 The goody bag was as rubbish as ever. Races really need to get a grip on this. If we’re trying to encourage people to be healthy, why undermine that with chocolate biscuits for post-marathon nutrition?! It’s a bugbear of ours and we will keep banging on about it until races get a grip (or someone hires us to help them understand what runners want and need after sweating their guts out for charity). The things we loved far outweigh our minor gripes, all of which we’ll put down to teething troubles that will be ironed out for next year. The Yorkshire Marathon is probably destined to become one of Britain’s best – it certainly must rank already as one of the prettiest. Whatever curses we may have uttered on seeing that hill at mile 25, we’re glad to have taken part in the first one. When we finally think of somewhere to hang all our medals, the pleasingly-designed Yorkshire Marathon ones will take pride of place. Superb,every race has its niggles! Remember your yoga/plates-itis what it is! Superb,every race has its niggles! Remember your yoga/pilates-itis what it is! Congratulations! I went to the University of York – so strange to see it as a backdrop for race pics when the last time I was there it was graduation pics! No matter what department you studied in, I bet there were people in all of your loos! It was the BEST place to start a race. Definitely recommended.